No doubt, tattoo is the easiest way (painful though) to acknowledge your love or fan following. Tattoo worship is not limited to celebrities or the beloved Hello Kitty but can go much beyond that has been recently proved by this young girl, who is a proud âXanganâ. 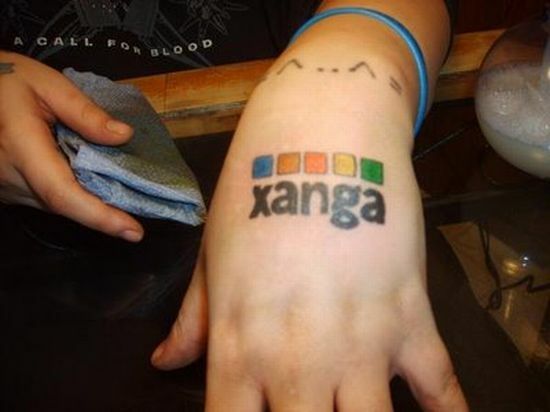 Yes, her tattoo reads âXangaâ (networking site used largely by teenagers) and is an all-pompous declaration of her devotion to this online community. After this, we might probably come across the âOrkutâ, âMy Spaceâ or the âFacebookâ tattoos. What say? Monitor your diabetes with a tattoo! Fairy and stars tat too!